Rollo lines are supplied for different capacities an-d with different degrees of automation. The rotary design of Rollo stick novelty freezers is space-saving to avoids the inversion of moulds, minimize product, brine loss. The brine syste-m is completely enclosed so that brine is unable to enter the moulds,contaminate the products. Rollo line is designed to meet the requirements of a flexible, reliable moulding machine. It performs at optimal speed with high capacities, ensuring steady, reliable production. 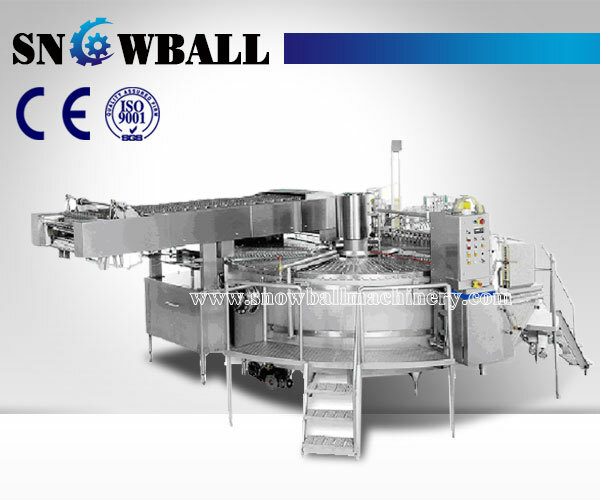 By combining with the wrapping machine, you achieve very high efficiency. We supply a wide range of filling equipment for the production of a variety of stick novelty products. Easily accommodates bulky inclusions such as pieces of fruit, nuts, chocolate, wine gums, providing endless opportunities to raise the attraction value of new products. If required the bars can be coated with chocolate, dry ingredients after extraction from the moulds. Capacity from 8000---10000pcs, 10000---20000pcs/hour, 21000---36000pcs/hour all can be choice. 1. The brine syste-m is completely enclosed so that brine is unable to enter the moulds an-d contaminate the products. 2. Steady, reliable, an-d high efficiency. 3. Customizable. We would provide professional solutions.